Glass mosaic tile is one of the most selected surface patterns when it comes to swimming pool design and any other contemporary poolscapes. 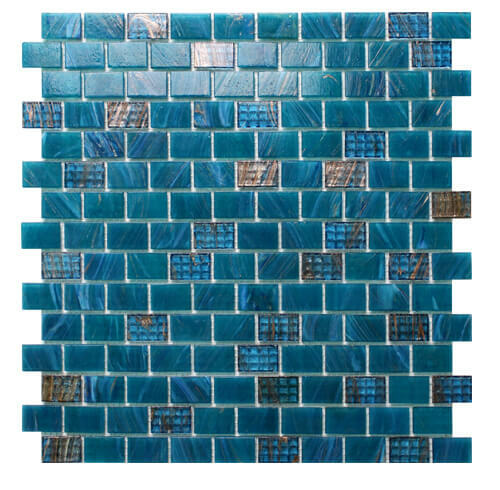 Glass mosaic tile features high durability, waterproof, wear-resistant and have lots of options in shapes, colors and textures. You can add dimension and iridescence to your swimming pool with the translucent surface, which can not achieve from ceramics and stone. 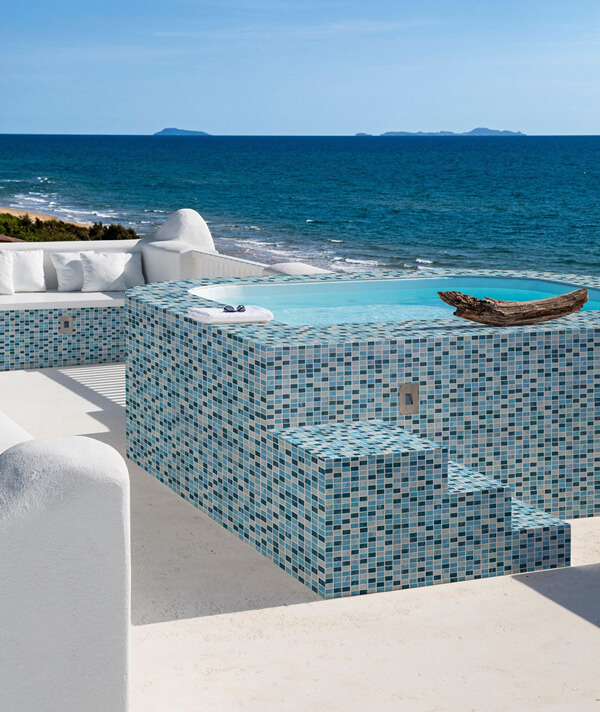 With wide choices in glass mosaics, the surface pattern gives new ways for builders finishing pool, spa and any piscine spaces. 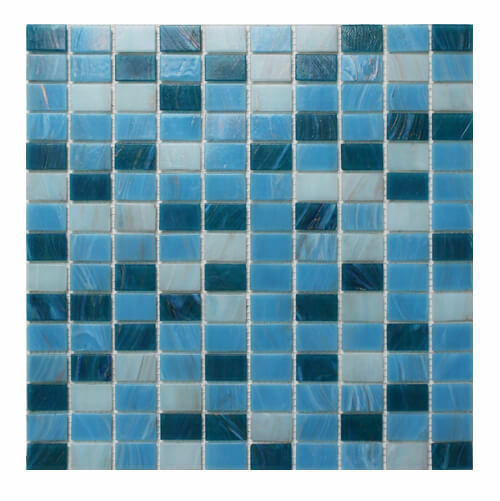 Glass mosaic tile now is a popular request for swimming pool design. Today we are going to recommend 3 items of pool glass tiles for those want a luxury pool style, scroll down and take a look to get inspiration for your next pool projects. The glass items produced in a stackbond sheet makes your installation easier and gives clean line to your swim pool appearance. The mix of 3 blue shades paired with golden line on finish adds dimension and characters to any spaces. It surface pattern can work for indoor and outdoor use, applied in steps, benches and pool surround areas for a focal point. 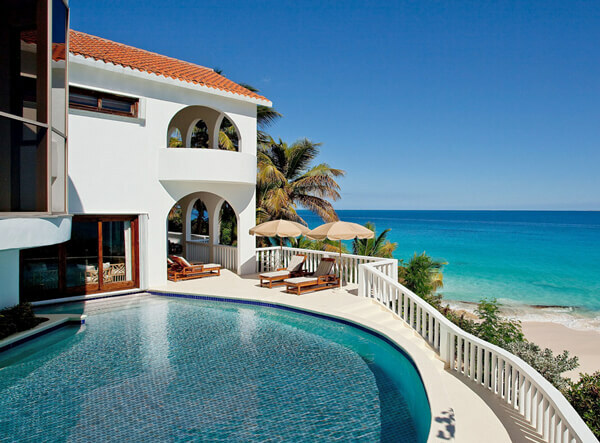 Like the example below, this product generates the uniform and subtle seaside pool look, it is incorporated seamlessly with the white-hue surrounding and infinite ocean, creating a comfortable and relaxing area for vacation. Many of our clients including homeowners, they prefer to take glass mosaic tile to cover their private backyard pool or villa house pools. They are attracted to glass mosaic tile due to its aesthetic values more than its applicability, it is super ideal for making elegant and exquisite style. For those looks for spectacular material for swimming pool, glass tile is a great consideration. The tile sheet features brickbond design, a classic subway sheet, adding a sparkling visual to the villa pool below, the reflection of light and water, creating a dynamic and lively visual effect. It is a great investment to bring endless beauty and values to the house. 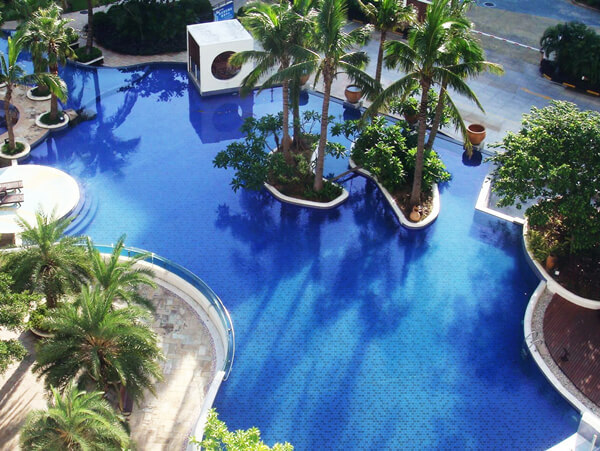 For swimming pool design, especially commercial pool project, the material of pool cover is a big part. Most builders and designers believe that people mostly feel a emotional response to the glass pool finish, glass tile is the primary option for them. 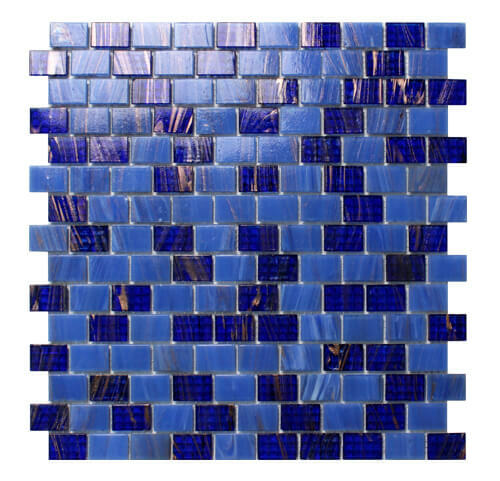 Look at our luxury iridescent glass pool tile in blue mixed color and matte finish, its alluring translucence and subtle variation provides a stunning appearance. Bluwhale Tile is a professional pool tile wholesaler from China, we produces high quality mosaic tiles special for swimming pool for many years. We have great expectation for cooperating with all customers from all over the world. Customized service can be accepted here and our good service will satisfy you a lot.